Ancient beliefs in Ireland, Britain, Denmark, Sweden, Norway, Iceland, France and Germany included a Stonehenge Sun calendar: sixteen months a year, four week months, five day weeks. Stonehenge Sacred Symbolism reveals the Bible’s Old Testament tale of the disappearance of Sodom and Gomorrah actually occurred about 2250 BC. Founded upon scientific atmospheric data, glacier ice cores and petroleum industry records, see why India, China, the Americas, Britain, Malta, Egypt, Palestine, Jordan, Sumeria all suffered starvation, cold and drought conditions about the same time. Empires collapsed and humanity reverted to a basic frugal existence. The sea-linked peoples of the north-west: Ireland, Britain and western Europe have much in common. 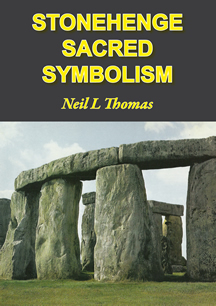 Pre-historic deities, legends and myths, Sun and Moon calendars, feet fathoms and furlongs, all are revealed in Stonehenge Sacred Symbolism. The pre-historic peoples of Ireland, Britain, Denmark, Sweden, Norway, Iceland, France and Germany exhibit similar elements of ancient beliefs and a Sun calendar: sixteen months, four weeks a month, five days a week, 365 days a year. Days could have been named for the ancient deities Sun, Moon, Woden, Thor and Freyr. 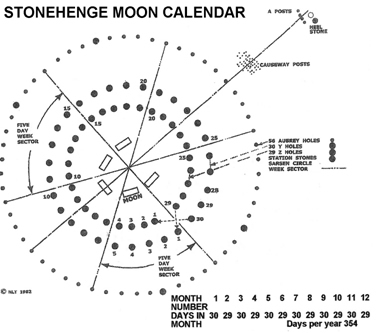 The Stonehenge Moon calendar featured two rings of pits dug into the subsoil. Back-filled with white chalk lumps, thirty Z Holes formed the outer ring, twenty-nine Y Holes formed an inner ring. A Moon month is 29½ days, 59 days in two months. From the centre, imaginary lines drawn between the trilithons form six segments equal to six weeks of five days, perhaps given the same day names as the Sun calendar. Alternate months had only four days in the fourth week. 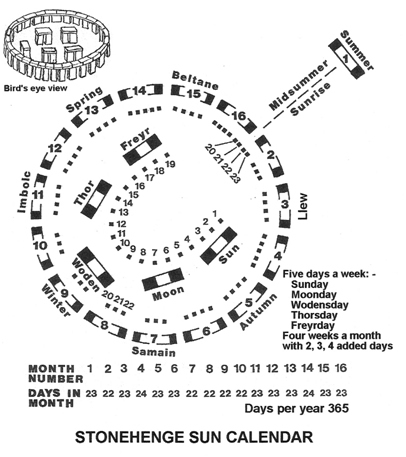 Six counts around fifty-nine Y and Z Holes equalled 354 days, a twelve-month Moon year. Ireland’s ancient monuments at Knowth and Newgrange c.3500 BC show the earliest comprehensive writing and arithmetic abilities in mankind’s history, thirty-six or so symbols employed in petroglyphs demonstrated the Sun and Moon calendars. Counts of thirty-three had symbolic meaning. The world's four major religions continue to employ thirty-three to imply or infer a sacred state or an ultimate heavenly situation. Right-angled triangles, Pi or π = 22/7, odd numbers and their symbolism were employed in the north-west during the fourth millennium BC. The first millennium BC Greek philosophers Pythagoras, Archimedes and Euclid probably inherited their mathematical knowledge from the Stonehenge people of ancient Britain. England’s largest ancient monument at Avebury was built about 2500 BC. Three times thirty-three massive stones enclosed a fertility shrine, a justice court, a good health symbol. Four entrances crossed the encircling ditch and embankment. These features are mirrored in the Icelandic Creation Of The World myth told in written form about 1200 AD. Linear measures, the Celtic foot, the short yard and faethm [fathom] the furlang [furlong] were known throughout history and in Stonehenge times. The prehistoric Long Man of Wilmington figure on a hillside in Sussex, England is thirty-three faethms equal to one furlang from head to toe. The first cricket game pitch was ten faethms long. Baseball and cricket have this common origin on the south coast of England. Review : The Monash University Research Review by its Editor, another by The Age Science correspondent, these both say much that needs be said. The manuscript assessor''s comment makes the point the book has been subject to an academic peer review.